If you’re growing green with envy gazing at some of the gorgeous photos on Pinterest or your Facebook feed, and feeling bad about your own camera and picture-taking abilities, worry no more. Borrow Lenses, a company that works like the Netflix of camera equipment, allows you to rent cameras, lenses or accessories at really affordable prices to take along to document your next family trip, or just try before you buy your next camera. Borrow Lenses is doing their part to put professional-level photography within reach. For instance, if you’re embarking on a week-long family vacation and want to buy a brand new Nikon 5100, it could run you around $700-$900. But if you only need use of a camera on major trips and for just that week, you could pay about $115 to rent the body and lenses. You can even rent underwater camera gear, like my favorite, the GoPro Action Cam products. Camera bodies and lenses are priced separately, which is great news for someone like me who’s been saving up to buy a new $3,300 lens, but may not have it in time for the kids’ upcoming birthday party. Renting one for a couple of days is my new back-up plan. 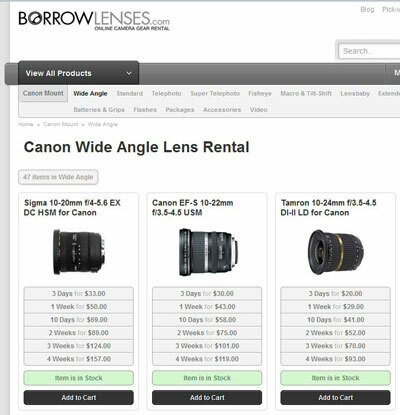 To rent from Borrow Lenses, just go to the website, and pick out the camera, lenses or accessories that you want to rent. Pricing is dependent on the length of time you have the items and how expensive the camera is. The longer you borrow the cheaper the cost is per day, and you have the option to buy insurance, which might ease a little stress in the event that something happens to the camera. With a simple email, you can extend your rental in many cases, too.